Across this great land, piled behind millions of grocery and department stores, are millions of reusable wood block pallets. At many of those stores, teenagers working their first jobs have been ordered to add another pallet to the stack out back, and are thinking, “Ew, I have to touch that?” Wood pallets easily collect grime and splinters with use, but getting them clean is tricky. Washing a wood pallet with water is out of the question, as wood is porous and the moisture absorbed by the wood can cause problems with mold, mildew, and bacteria down the road. Knowing how to sanitize plastic pallets means understanding what sanitization solutions to use and having access to the proper equipment. Cleaning a food grade plastic pallet, on the other hand, is usually a simple matter of wiping it down or running it through a pallet washer. Sanitizing a plastic pallet, however, is trickier, as it means ensuring that the microorganisms on the pallet are almost completely eradicated without using harsh chemicals like bleach that could contaminate food. Knowing how to sanitize plastic pallets means understanding what sanitization solutions to use and having access to the proper equipment. For this reason, deep cleaning plastic pallets is usually best left to a third party like a pallet pooling provider that rents plastic pallets. Wipe Down: A employee with a rag and some all-purpose cleaner can remove light soiling and dirt from the surface of a plastic pallet simply by wiping it down. A vigorous scrubbing can remove heavier spots. This method of washing pallets has the advantage of being easy, but it’s also slow, and doesn’t provide the most thorough cleaning. Power Washing: If a pallet becomes heavily soiled with something that is difficult to remove, a power washer is one option. Power washing can be used in conjunction with detergent, and is an effective way to remove visible contaminants from plastic pallets. Its drawbacks are that it takes up space and releases generous amounts of water onto the property that you may not want coming into contact with equipment, products, or wood pallets. Automated Washer: A thorough cleaning can be accomplished with very little manual labor through the use of an automated pallet washer. This machine washes the pallet with detergent, thoroughly rinses it with high-pressure hot water, and, in some machines, also dries the pallet. The system is self-contained and the water stays within the machine. The drawback is that many of these machines are relatively small and only capable of handling a few pallets at a time. Whatever method is used, it should involve a good all-purpose cleaner that is free of bleach and other hypochlorites, which can pose a risk of contaminating products loaded onto the pallets later. 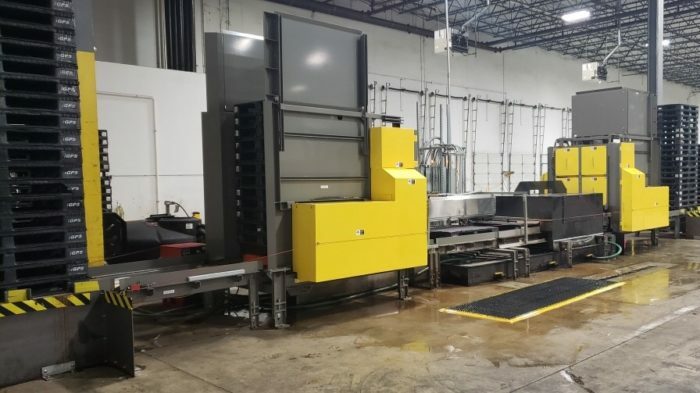 It also should be noted that none of these methods of washing pallets is very well suited to turning out large numbers of clean pallets in a short period of time, as this requires specialized equipment on a large scale. Because of the need for proper equipment, proper chemicals, and the space to use them, it’s rare for companies to wash their own plastic pallets. If your company manages its own supply of pallets, it probably contracts with another company to have them cleaned. If you’re in the food or pharmaceutical industry, you may contract with another company to have your pallets sanitized. That’s because, while using a power washer to rinse pallets or taking them to a facility to be cleaned helps keep microbe counts down, it doesn’t truly sanitize the pallet. In order to truly sanitize a plastic pallet, it must be treated with a substance that has been demonstrated to kill a certain percentage of microbial life within a period of time. The pallet must be treated for the prescribed amount of time and cannot be exposed to microbes after being sanitized. If a sanitized pallet is placed in a trailer or carrier that hasn’t also been disinfected, the pallet can no longer be considered sanitized. For companies interested in sanitized pallets, a plastic pallet pooling rental service can take care of sanitization–including of the transportation vehicle–for you. This is an issue that most supply chains have had trouble cracking. Wood pallets can’t be washed without the risk of mold and mildew, and they tend to absorb and retain any chemicals, such as fungicides, used to treat them. While more hygienic plastic pallets can be easily disinfected, the problem comes after they are sanitized: if placed in a trailer that hasn’t also been disinfected, they can no longer be considered sanitized. For the meat, poultry, and even pet food industries, the possibility of microbial contamination is a serious issue. Given that new rules regarding the Sanitary Transportation of Human and Animal Food are now enforced as part of the Food Safety and Modernization Act (FSMA) industry standards, keeping plastic pallets sanitary until they are loaded with product will be increasingly important for anyone working in food supply chain management. For companies interested in sanitized pallets, a plastic pallet pooling rental service can take care of sanitization–including of the transportation vehicle–for you. iGPS has developed a method by which a safe, non-toxic disinfectant is misted into a sealed trailer, sanitizing both the pallets and the container they are shipped in. The container is sealed while sanitization takes place and remains that way until it arrives at your production facility. The service supplies not just clean but sanitized pallets, helping prevent the introduction of bacteria and other microbes into food and pharmaceutical production areas. The iGPS pallet pool rents a nonabsorbent plastic pallet that can be thoroughly sanitized and shipped in a sanitary container to your production facilities. To get started with the easy-to-clean shipping platform of the future, give our team a call at 1-800-884-0225, email a specialist at switch@igps.net, or visit our contact page.